Red-light cameras have been a divisive issue in City Hall ever since Mayor Byron W. Brown began proposing them in 2007, only to run into repeated opposition from the Common Council. Fast forward to Thursday, when the issue was just as divisive among residents, as the cameras get another look after a rash of hit-and-run accidents, including three fatalities, in the past two months. The majority of those attending a City Hall hearing were steadfastly against the idea, while those interviewed near the scene of one of the fatalities on the city's East Side uniformly backed the controversial cameras. Most who spoke during a public hearing in the Common Council chambers opposed installation of the cameras, saying it’s a money grab for the city, that the technology won’t make the city safer and that the most underprivileged communities would be most affected. “I’m outraged. We’re not going to take this kind of nonsense anymore. None of the data shows it makes the city any safer. All it shows is that money is taken from the poorest communities,” said James Rust, who lives near Summer Street and Elmwood Avenue. He was among about a dozen residents who spoke during a public hearing called by University Council Member Rasheed N.C. Wyatt. Meanwhile, near Broadway and Gatchell — where a man was killed by a hit-and-run driver two weeks ago — residents interviewed Thursday were overwhelmingly in favor of putting red-light cameras in their neighborhood. Out of eight residents interviewed, all were in favor except one woman who was non-committal. 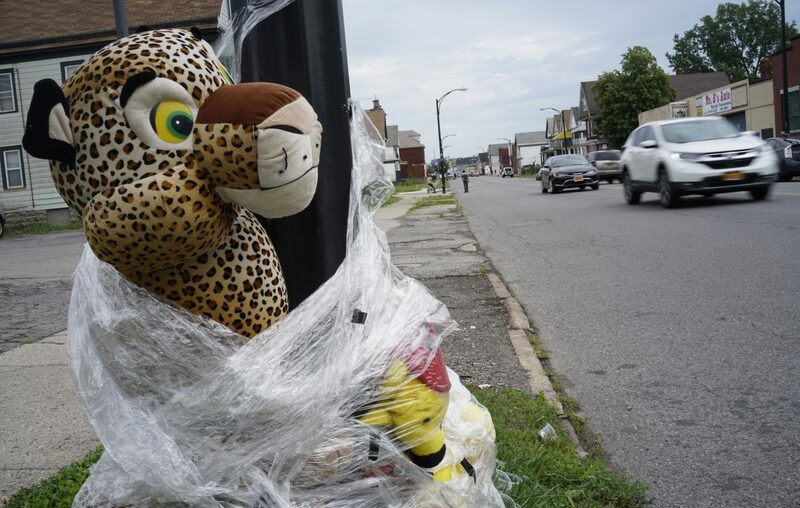 Typical of those supporting the cameras was Moneer Uddrn who, before moving to Buffalo, lived in Atlanta, where the cameras are scattered throughout the city. One day he ran a red light and received a ticket in the mail a few weeks after. Along with the ticket were three photos: one taken the second before the violation, one taken as his car crossed the intersection, and then a closeup of his license plate. Uddrn ended up paying the fine and also paying more attention to the “red light photo-enforced” signs. 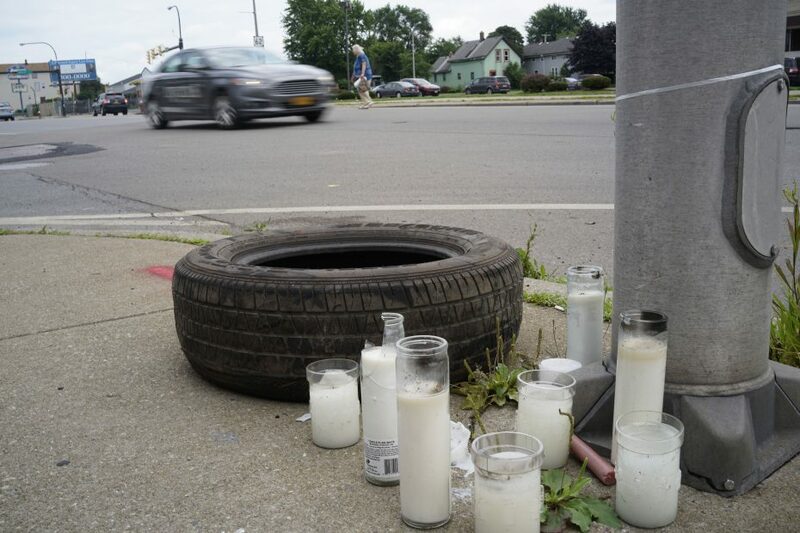 If signs start popping up in Buffalo, people will be more inclined to stop, he said. While safety is a reason to implement the cameras, Uddrn said the city’s efforts are likely money driven, as well. The more tickets, the more revenue for the city. But even if that’s the case, it’s still a “yes” for him, as long as the data collected from the cameras isn’t misused or sold. “I hope it makes a difference,” Gardener said. Wyatt supports using red-light cameras to cut down on speeding and accidents in neighborhoods and to reduce crashes at intersections. He hosted the public hearing to explore how the automated enforcement might help curb speeding. He plans to make a push for the technology when the Council is back in session in September. Also on hand during the public hearing was Dorian Grubaugh of GATSO USA, which provides traffic enforcement cameras to municipalities, to describe how the technology works and its benefits. Wyatt emphasized that no decisions have been made on acquiring the technology, and no contracts have been awarded. The project would have to go through the bidding and approval processes first. GATSO volunteered to come and to talk about the technology and answer questions from the community. The cameras record the license plates of vehicles that run through stoplights and tickets are then mailed to the owners. Grubaugh said that GATSO would produce the equipment, install it and process the images, which would be saved for 30 days — a standard period whose length could be expanded. GATSO employees would put information from the cameras in a format for law enforcement to approve the citations and then the company would mail out the tickets. All of the data would be encrypted and wireless and then decrypted at the company’s corporate office. Grubaugh pointed out that police officers can only write so many tickets at a time, but the red-light camera technology can track the speed of 36 cars at a time in a six-lane road. “Our cameras are not just monitoring the red light. They are gauging the speed of every vehicle that goes through the intersection, which can let law enforcement know where the dangerous areas are,” said Grubaugh, who also explained pricing. Marcell Redden of the Easton Avenue Block Club was not impressed. The city already has surveillance cameras, she said. Grubaugh said the technology would raise awareness and prompt people to be more alert while driving. But Taniqua Simmons — a community activist and Humboldt Parkway resident who is running for Buffalo mayor — didn’t buy either comment. She was representing Buffalo United Community Coalition and said that city lawmakers should come up with different fixes. Instead of using the cameras, some speakers suggested other ways to slow down motorists like installing speed bumps, making yellow lights longer, synchronizing traffic lights and making sure police do more to enforce speed limits, especially in neighborhoods where they know speeding happens. Renata Toney, a member of the Arden-Newburgh Block Club on the East Side, said drivers know they can speed on Bailey Avenue and that the police won’t do anything. “A kid is tragically killed in Delaware Park, and changes happen overnight,” she said, referring to 3-year-old Maksym Sugorovskiy, whose 2015 death prompted reduced speed limits on other changes to the Scajaquada Expressway. She wondered why residents can't get the same kind of response in other communities. Her block club has been trying for two years to get a stop sign on Newburgh Avenue to slow down speeding motorists. "When that poor kid got hit" in Delaware Park, "I was amazed how quickly things changed. The speed limit changed. They replaced the barriers, and we're just trying to get a stop sign," Toney said, adding that she's not sure if installing red-light cameras is the solution. "But we've got to do something to let people know they have to follow the law," she said.